The biggest threat to Southern Californian homeowners is not fire, flooding, earthquakes or other natural disasters. It’s termites. Yes, these little buggers are responsible for nearly five billion dollars of damage in the U.S. every year. In San Diego, Riverside and Orange counties, it’s estimated that between 60%-80% of all structures have at least one minor termite colony in it. Chew on that for a minute. The drywood termite (Incisitermes minor) feeds on our homes, office buildings, and basically any place that they can sink their teeth. They typically arrive in late summer, riding the warm Santa Ana winds. Blind, directionless termites will chomp down on the first piece of wood they find, which, in most cases, is your home. Given their poor eyesight (they actually don’t have eyes) and the precarious fate determined by winds, about 99% of termites in a mating swarm will die trying to find a place to settle down (and you thought you were going through an existential crises). However, that one percent that finds its way onto your home, garage, gazebo, etc., can cause thousands of dollars worth of damage. These pests are often confused with flying ants, albeit with a pale white color. The similarities don’t end with their appearance. 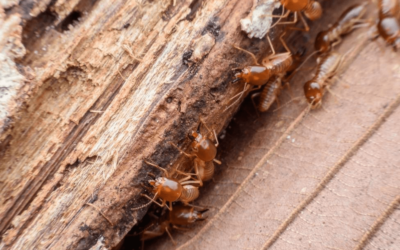 Like ants, drywood termites are very organized, and can develop complex colonies in your home without you even noticing. A female drywood termite emits a pheromone to attract a male. Once a pair has found each other, they’ll enter a crack or crevice in your home, and break off their own wings for easier burrowing (oh, the things we do for love). Then, they gnaw a pear-shaped chamber, where they mate. Young termites – aka “nymphs” – cause the most burrowing damage in their effort to help build the colony. A typical colony of drywood termites takes about four years to mature – all the while chowing down on wood and damaging your structure. Some nymphs grow up to become soldiers and alates, the reproductive swarmers that will continue the cycle. Wind or other circumstances can move swarmers from one colony to another wooden beam, making it possible for multiple colonies exist within the same structure. We hate to admit it, but termites are really good at their jobs. They’re like silent demolitionists: eating and destroying structures from the inside out, without leaving any noticeable trace. This is why they’re so pervasive in Southern California – nobody notices until it’s too late. We also recommend using preventative measures to keep your home termite-free. 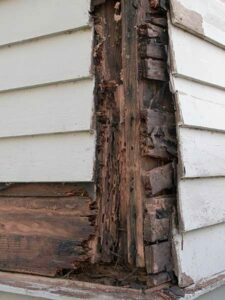 Staying up to date on house repairs is a time-tested method of preventing an infestation. This includes sealing all unpainted or exposed raw wood on your home or structure (fascia boards and rafter tails are like Club Med for these guys). Also, use fine mesh screens over vent openings. Termites love accessing your home through ventilation, but mesh screens are good for keeping them out. And finally, keep up to date on your termite inspection. Lloyd Pest Control provides free inspections, which we recommend doing every two years. If we find evidence of an infestation, we can treat it before any major damage is done. Early detection is critical to the structural integrity of your home.